If you've got breakfast and brunch on the mind, a recent opening is need-to-know. 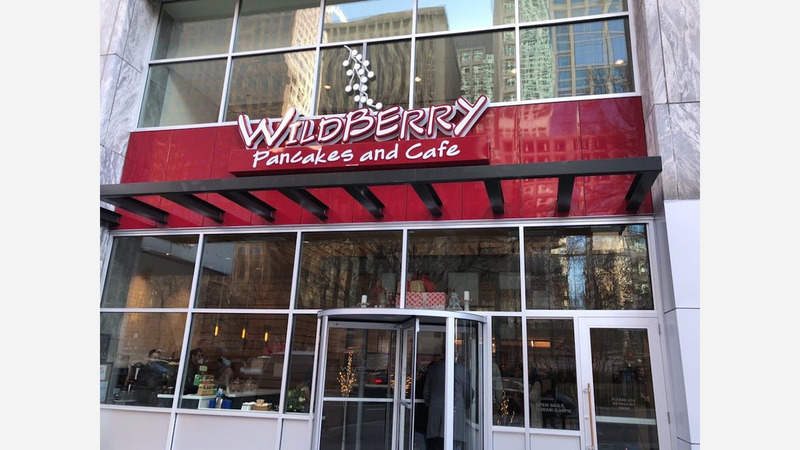 The newcomer to Streeterville, called Wildberry Pancakes and Cafe, is located at 196 E. Pearson St. (between Seneca St. & Michigan Ave.). This new cafe--which has three other Chicago area locations--features an extensive menu offering breakfast fare, brunch, lunch, and more. On the breakfast menu, expect to see dishes like house-made biscuits and gravy with two eggs any style; the "Los Altos Benedict" with chorizo, roasted red peppers, poached egg, chipotle hollandaise, pico de gallo and hash browns; and a "Garden Skillet" with eggs, veggies, cheese and hash browns. Switching over to the lunch menu, look for items such as a cranberry and turkey sandwich with cheddar, field greens, and applewood bacon on a pretzel bun; spicy tuna salad panini with jalapenos, cilantro, and tomatoes on sourdough; and a barbecue chicken tortilla salad with corn, black beans, tomatoes, and crispy onion strings tossed in a chipotle ranch dressing. Wildberry Pancakes and Cafe has proven popular thus far, with a 4.5-star rating out of 27 reviews on Yelp. Janrei V., who was among the first Yelpers to review the new spot on December 16th, said: "Best breakfast I've had in a while. Their skillets are fresh, the service was fast, and the hosts/servers/everyone here was extremely kind." Yelper Jerry H. added: "I'm wild about Wildberry! Great service, great food, and great pancakes. I came here with a friend, and we were seated as soon as we arrived." Swing on by to take a peek for yourself: Wildberry Pancakes and Cafe is open daily from 6:30am-2:30pm.